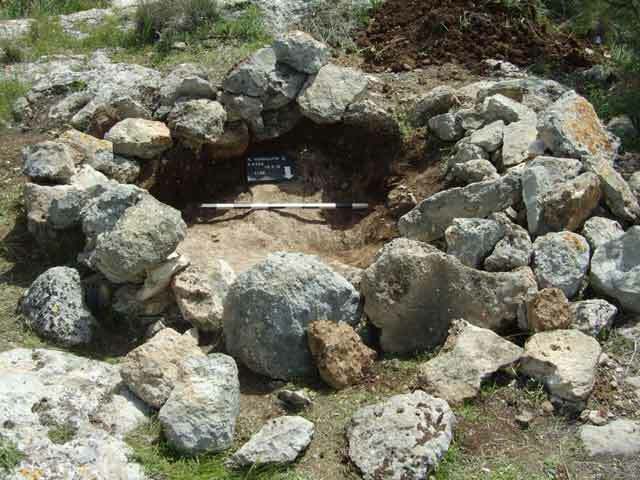 In February–April 2012, a salvage excavation was conducted at the site of Khallat el-Himara in Ramat Bet Shemesh (Nahal Yarmut; Permit No. A-6428; map ref. 198741–817/623318–86; Fig. 1), prior to construction. The excavation, on behalf of the Israel Antiquities Authority, was directed by Y. Paz (field photography), with the assistance of N. Nehama (administration), A. Hajian and M. Kunin (survey team), N. Zak, D. Porotzky and E. Belashov (plans), I. Lidsky-Reznikov (pottery drawing), N. Agha (archaeozoology), A. Yaroshevich (lithics) and M. Birkenfeld (GIS modelling). 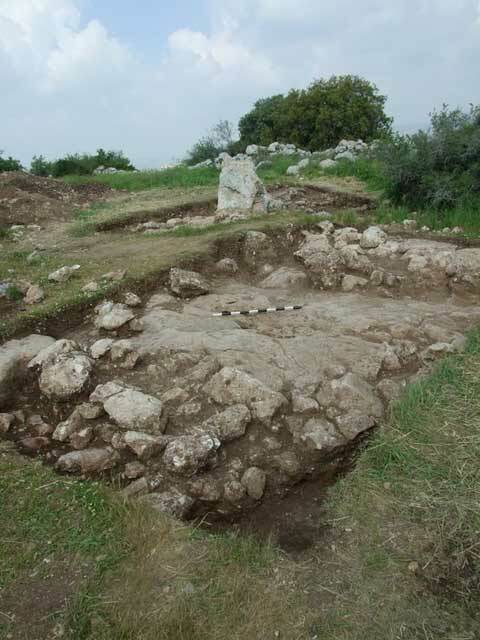 The site of Khallat el-Himara is located on an elevated limestone hill (over 400 m asl), surrounded by streambeds, including Nahal Yarmut, which in antiquity was one of the major water sources in this area (e.g., Dagan 2011:7). 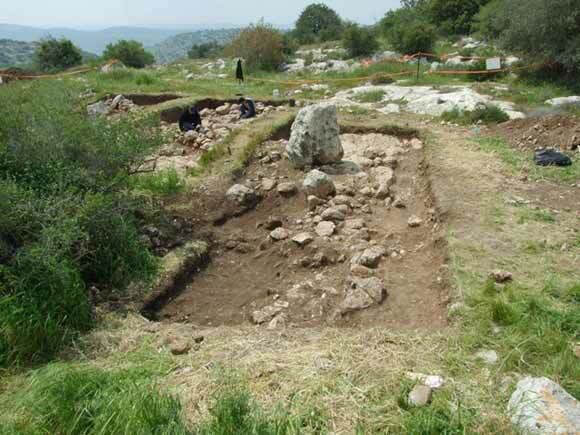 A large-scale trial excavation conducted in 1996 at the site explored most of the substantial remains, comprising an Early Bronze Age IB settlement on the northwestern slope, part of a Late Bronze Age settlement on a flat area on the southeastern side of the hilltop and various rock-cut and built installations on the hill’s moderate slopes (Eisenberg and Sklar 2000). Two areas were explored in the current excavation (A, B). Area A, the focus of the excavation, was opened in the flat area where the LBA remains were excavated in 1996, and it revealed the remainder of that settlement as well as later field walls. 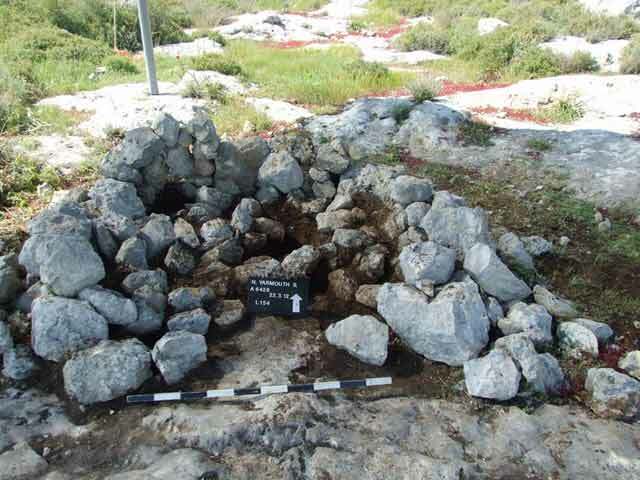 Area B comprised the various installations excavated around Area A: a watchtower, three built installations and a clearance heap. 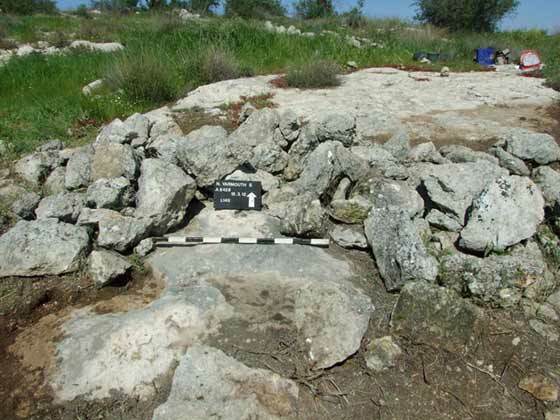 Subterranean elements that were found in this area—a limekiln, a columbarium, a water cistern and two rock-cut cavities—were not excavated due to the objection of orthodox religious groups. Although part of the EB IB settlement was razed prior to the development of Ramat Bet Shemesh, the rest of the hill is designed to be an open archaeological park. Area A was badly disturbed by agricultural activities, namely ploughing and terracing, that took place in modern times. Two subareas (eastern—Fig. 2; northwestern—Fig. 3) were excavated. They yielded very fragmentary architectural remains from the LBA that cannot be reconstructed in a comprehensive plan. The dark brown topsoil that covered the whole excavated area contained a mixture of pottery, mostly ribbed body sherds from the Roman and Islamic periods. The eastern squares. Six of the squares in the eastern part of the area (A/3–4, D–E/1, G/2–3; Fig. 2) were opened adjacent to the 1996 excavation squares in hope of identifying the continuation of architectural units unearthed in 1996. Squares A/3–4 were closest to the previous excavation, located immediately to its east. 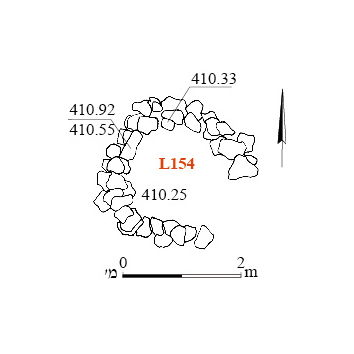 In the middle of Sq A/3 was an east–west artificial element comprising medium–small stones (L123) and resembling debris of a collapsed wall; it may have had some relation to a nearby wall excavated in 1996 (W91). The loci north and south of L123 (L127, L128), as well as L123 itself, yielded LBA pottery. 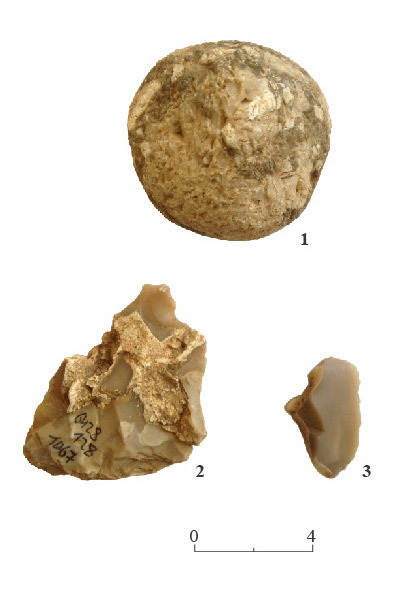 Locus 128 yielded two flint artifacts, including a flake with remains of cortex (Yaroshevich, below; Fig. 23:2). Squares D–E/1 yielded only light brown soil, which covered the bedrock. The soil contained LBA pottery, which was found mostly in deep soil pockets in the rock (L109, L110, L113). In the middle of Sq G/3 (Fig. 4), resting on bedrock, were flimsy remains of what may have been stone walls of a structure. Only one wall could be clearly discerned (W147; length c. 3 m, presumed width c. 0.5 m); it was built of medium- to small-sized stones (length 0.2–0.4 m) and ran in a general east–west direction. The locus to its north (L145) yielded mixed pottery, dating from the LBA and Roman period, whereas to its south (L131) were large sherds belonging to LBA vessels and a flint hammerstone (Yaroshevich, below; Fig. 23:1). Square G/2 yielded mixed LBA and Roman-period pottery sherds (L125). The two northern squares in this part of the area (B/5, D/5; Fig. 2) were opened north of an east–west trial trench (Trench 9) excavated in 1996 along the perimeter of the LBA settlements. Since the trench yielded no architectural remains, these squares were opened to explore whether any separate structures existed north of the trench. These squares yielded nothing save mixed pottery sherds that rested on the bedrock, within dark brown soil. The high bedrock in these squares, which in some cases was found only a few centimeters below surface level, suggests that if any structures stood here in antiquity, they have been completely razed, leaving no remains. 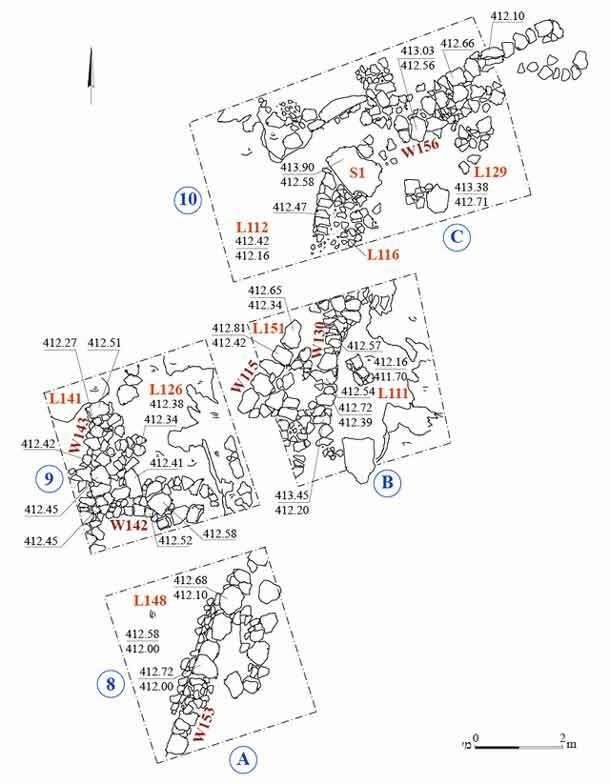 Moreover, since the same picture emerged from the trench excavated in 1996, we can assume that the cluster of structure in the LBA settlement was very limited in size, covering c. 700 sq m south of the trench. The northwestern squares. 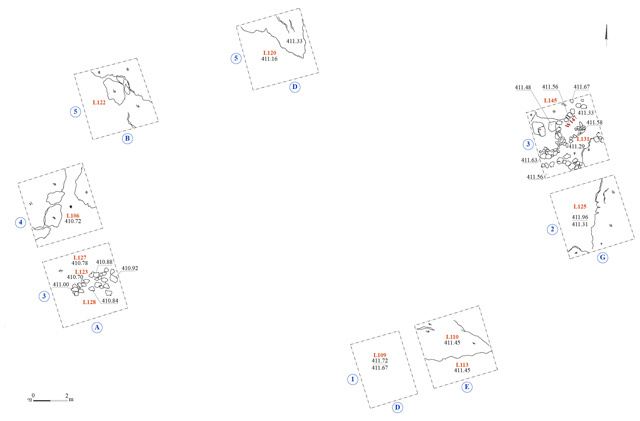 The five squares in the northwestern part of Area A (A/8–9, B/9–10, C/10; Figs. 3, 5) were opened on an elevated rock terrace at the western edge of the flat area. 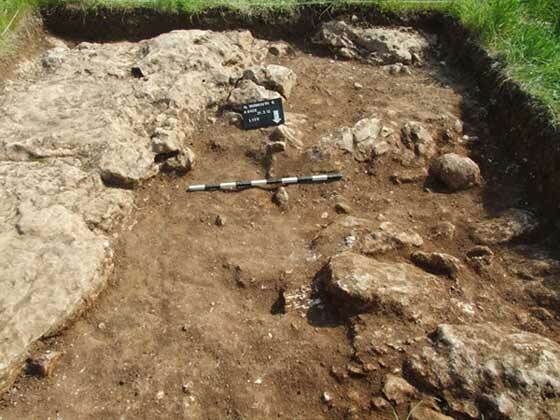 The focus of the excavation in these squares was a huge standing stone (S1, Sqs B/10–C/10; length 1.25 m, max. width 1 m, max. height 1.32 m; Figs. 5–7) located at the highest point on the hill and attributed to the LBA. It was situated in a northwest–southeast direction; its western face seems to have been straightened, and its eastern face was grooved. A line of brown flint that runs across the stone’s southern face may have added to its unique appearance. 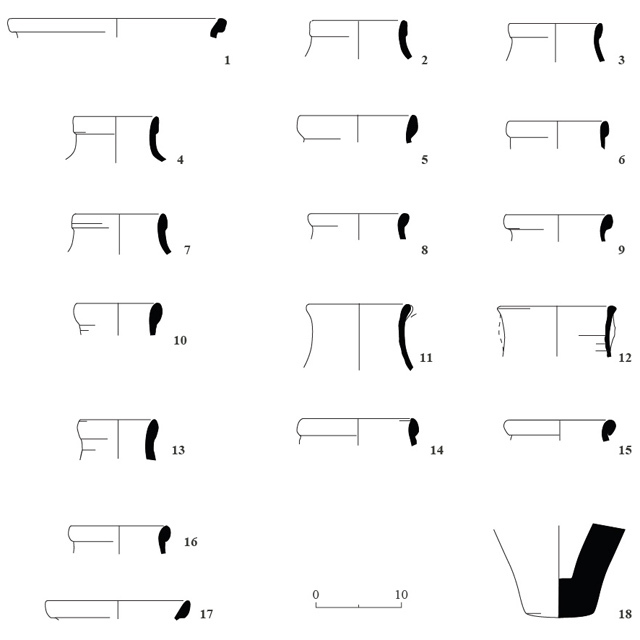 A section of a long field wall (W130; preserved length 4 m, width up to 0.5 m; stone sizes 0.2–0.5 × 0.3–0.5 m; Fig. 8) of unknown date that crosses this part of the area in a general north–south direction was constructed directly on the bedrock and thus damaged the earlier remains; in fact, most of the excavated loci yielded mixed pottery, from both the LBA and the Roman period. 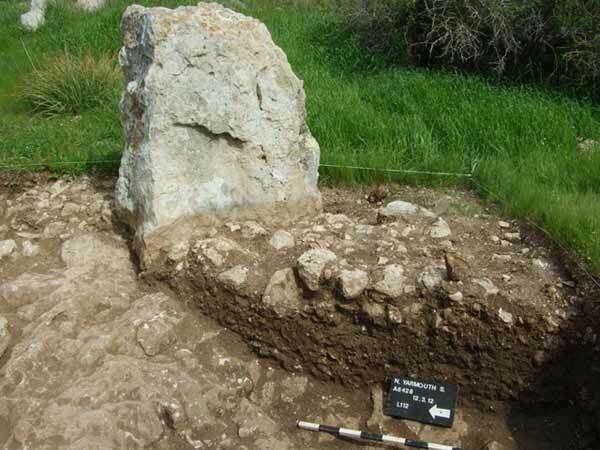 Despite this disturbance, the excavation sought to examine the standing stone (S1) and the single structure (L126) that seemed related to it, so as to reveal the purpose and exact context of the stone. A fill to the southwest of the stone (L112) yielded five knapped flint artifacts, including a knife with gentle retouch (Yaroshevich, below; Fig. 23:3), and animal remains, including donkey teeth (N. Agha, pers. comm.). Structure 126 (Sq B/9; Fig. 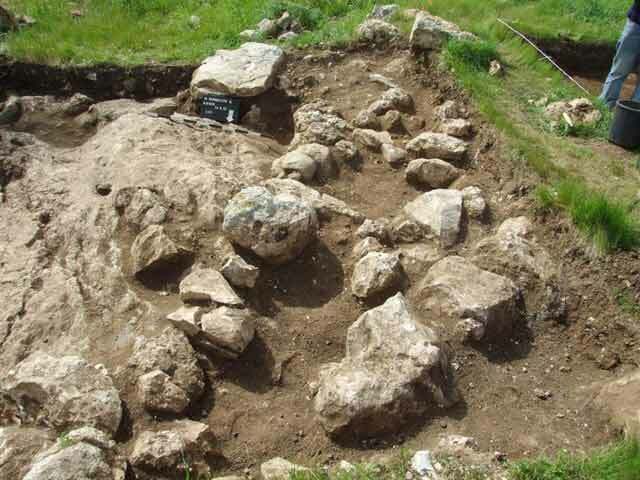 9) was unearthed to the southwest of S1. It is the only architectural unit in the vicinity of S1 that may date from the LBA, the assumed date of S1. Its remains, founded on the bedrock and on an earthen fill that leveled deep pockets in the bedrock, were poorly preserved: two collapsed walls (W142, W143; preserved length c. 2 m, c. 2.5 m, respectively), built of medium-sizes stones, that formed a southwestern corner of the structure. 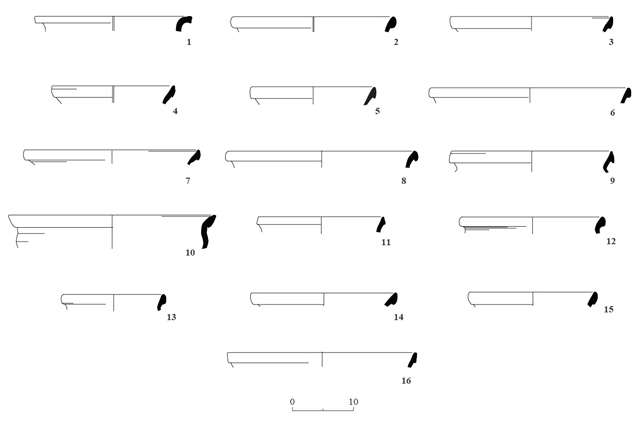 The orientation of a third wall (W115; preserved length 2.4 m, width 0.5 m), unearthed in the northwest corner of Sq B/10, may have belonged to this structure as well, although its construction method is different: one line of large stones (length up to 0.5 m). The pottery from Structure 126 was dated to the LBA and comprise mostly cooking pots. Two later features cut through this part of Area A. The first is a long wall comprising W130 and its continuation southward in Sq A/8 (W153; preserved length 5 m, width up to 0.5 m) ran in a general north–south direction. The southern section (W153), unlike the northern part (W130), was constructed on a bedding of small stones that were used to level the surface. Wall 153 was constructed of both large stones (0.5 × 0.7 m) and much smaller ones. Although this long field wall clearly postdates the LBA activity at the site, its date is unclear. However, judging by the pottery unearthed in this part of Area A, a date in the Roman period is plausible. 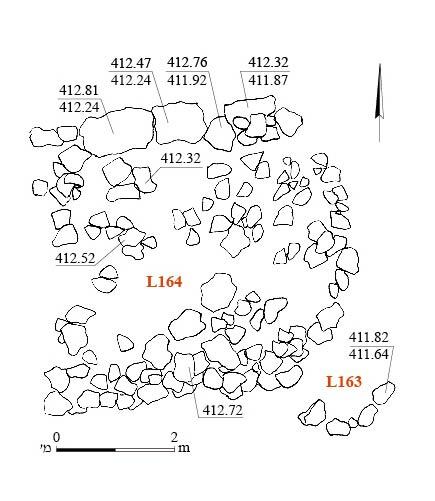 The second late feature is a mass of stones (W156, Sq C/10) lying in a northeast–southwest direction, probably the remnants of a wall of which only one course of medium-sized stones was preserved in situ. 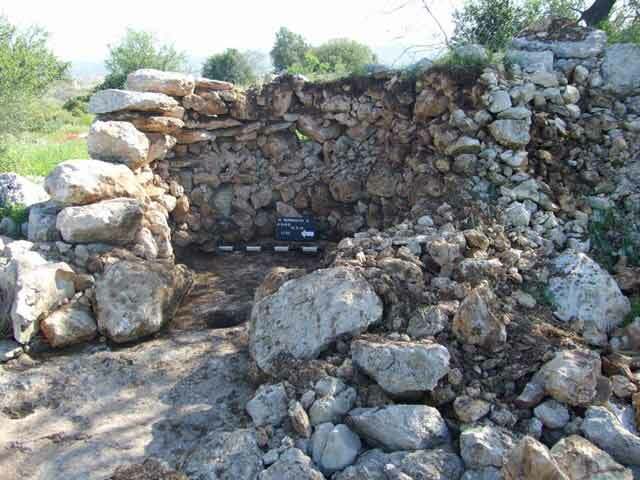 A meager amount of pottery from the Roman period was retrieved from the soil accumulated between the bedrock and the upper level of this stone collapse. The excavation in Area A yielded only 76 diagnostic sherds from the LBA; no complete or restorable vessels were found. The repertoire of shapes was rather limited, and did not include any imported vessels. Most of the vessels were made of brownish-orange clay with light inclusions, mostly white limestone. The inclusions were found in both cooking and storage vessels. The most common types were storage jars (27 sherds) and cooking pots (26 sherds), followed by bowls (20 sherds), and jugs and juglets (6 sherds). Bowls (Fig. 10:1–12). One straight-sided bowl was found (Fig. 10:1). This type was not reported from the 1996 excavation. It was made of brownish clay, and was medium fired. Another very rare type of bowl at the site is the plain-rim hemispheric bowl (Fig. 10:2). On the other hand, carinated bowls with thickened and sharpened in-turned rims (Fig. 10:3–5) were very common. Some had a ledge- or hammer-like profile, while others had simpler rims. The bowls were not decorated, except for Bowl 5, which had vertical knobs (for a close parallel from Tel Afeq, see Gadot 2009: Fig. 8.61:1). Two other types are deep bowls that had thickened rims with a triangular and slightly inverted profile (Fig. 10:6, 7) and large, sinuous-shaped bowls, with thickened walls and a variety of rim shapes: plain, slightly thickened or averted (Fig. 10:8–12). Some of the vessels of the latter type may have been pedestal chalices, but since no complete vessel or joint body-pedestal parts were found, this cannot by verified. Carinated kraters (Fig. 10:13–15). The few sherds that seem to have originated in this type of vessel were made of orange-brown clay, with white grits; their gray core testifies to rather poor firing. Specimen No. 15 is a disk base that seems to belong to a krater. This base was deliberately perforated, and thus went out of use, in what may have been a symbolic act. Cooking pots (Fig. 11). One rim (Fig. 11:1) belongs to a grooved, rectangular-rim cooking pot. Although it was found in a mixed context, its shape and pink clay are distinctive and rare at the site. Morphologically it is more at home in the late Middle Bronze Age – the beginning of the Late Bronze Age. 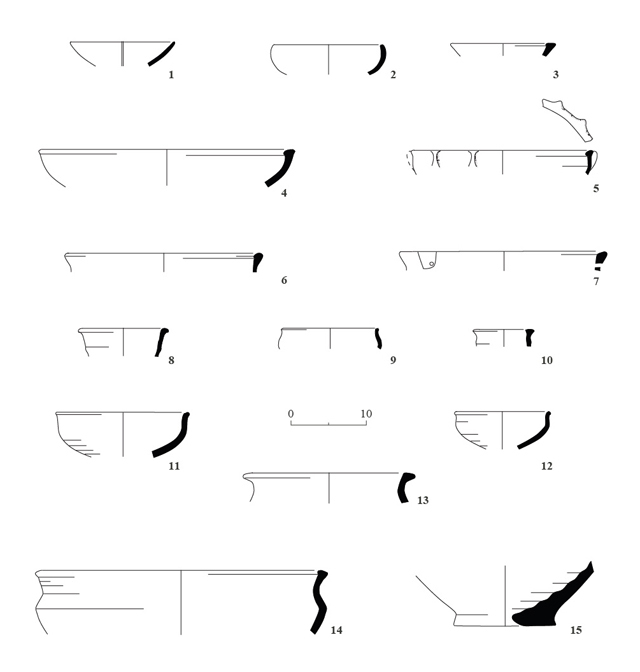 The vast majority of the cooking pots are of the gutter-rim type (Fig. 11:2–16), a fully developed cooking pot. These vessels were made of brown clay with white grits; some bare soot marks. Storage jars (Fig. 12). 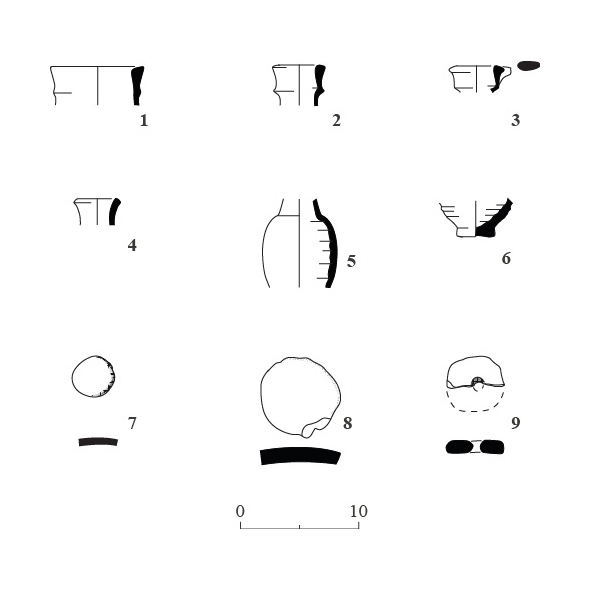 Although abundant, no complete or restorable vessels were found, unlike the 1996 excavation, which yielded five restorable jars (E. Eisenberg, pers. comm.). The jar fragments found in our excavation seem to be on the whole similar to the type found in 1996: they have rather high necks and thickened rims that slightly vary in shape. They had thick, massive bases that are common in LBA contexts. Jugs and Juglets (Fig. 13:1–6). Nos. 1 and 2 belong to a thickened rim with a ridge at the join with the neck. No. 3 has a carinated upper part, a triangular averted rim and a loop handle, which was not preserved; this vessel may have been a flask. Varia (Fig. 13:7–9). Two stoppers were found (Fig. 13:7, 8): No. 8 may have sealed a jar; and No. 7 may have sealed a smaller vessel. A fragment of a ceramic object, round and perforated (Fig. 13:9), was either a weight or a type of a stopper. 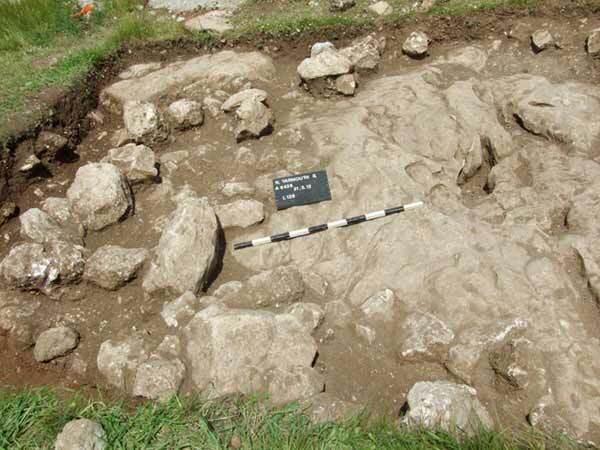 Along with the LBA pottery, the excavation in Area A yielded sherds from the Early Bronze Age and Roman period. Four EBA sherds (Fig. 14:1–4) were found very close to bedrock, within in LBA contexts: a bowl with a hammer rim (Fig. 14:1), similar to vessels unearthed in 1996, which can be dated to the EB IB; a small fragment of a platter (Fig. 14:2), which may be at home in early EBIII contexts at Tel Yarmut; and a flat base and a coarse body sherd with an applied, rope-like decoration, which probably belonged to large storage vessels (Fig. 14:3, 4). Five Roman-period sherds (Fig. 14:5–9) were found in various contexts, none of which could be associated with any specific built element: a basin with a flat rim made of white-buff clay (Fig. 14:5), possibly from the Late Roman period; a small bowl with thin walls and a flat rim (Fig. 14:6), possibly from the Early Roman period; a carinated cooking pot (Fig. 14:7); a plain, upright rim of a jar (Fig. 14:8); and a small fragment of a Herodian oil lamp (Fig. 14:9). Area B is the rocky terrain that surrounds Area A. A watchtower and built installations were excavated on the southern slope of the hill; a clearance heap was examined on the northern slope. Watchtower (L132; Figs. 15, 16). This is a well-preserved rounded structure (diam. 3.3 m) near Area A, which overlooked the southern slope of the hill. Its western part collapsed and it was somewhat eroded, but otherwise, the structure was perfectly preserved, with its delimiting wall (W139) preserved up to eight courses (height 1.7 m). Its lower course was constructed of large boulders (up to 0.50 × 0.75 m), whereas other stones were smaller (c. 0.3 × 0.4 m). The structure was filled with gravel mixed with brown soil, suggesting that it served as a base for an upper story. The fill contained pottery of various periods, but mostly black Gaza Ware that was used in the twentieth century CE, dating the structure to modern times. Built installations (L136, L140, L154). 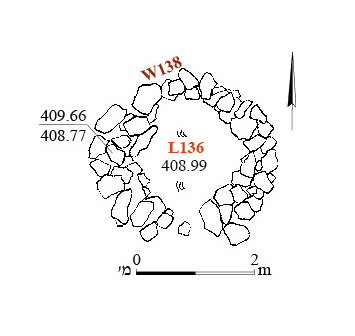 Three rounded installations flimsily built of medium-sized fieldstones were excavated: two (L136, L140) down the southern slope, and one (L154) c. 100 m to their west. Installation 136 (outer diam. 3 m, inner diam. 2 m; Figs. 17, 18) was delimited by a round wall (W138) built of medium–large stones preserved up to three courses (height 0.9 m). Within it was brown soil mixed with small stones and a few non-diagnostic body sherds. Installation 140 (Fig. 19) was poorly preserved, and thus its original size is unknown. Installation 154 (inner diam. 1.8 m; Figs. 20, 21) was preserved to four courses of small–medium sized stones (height 0.22 m). It was partly destroyed, and stone debris covered the bedrock, on which it was constructed. No diagnostic pottery was found inside the structure. Stone-clearance heap (L164; Fig. 22). A large heap of stones was examined near the northern edge of the hill. The heap was piled against a very massive retaining wall constructed of boulders (up to 0.5 × 0.6 × 1.0 m). The date of the wall could not be determined. It is highly plausible that the watchtower and the other built installations on the southern slope of the hill were all part of the same phenomenon. The orchards that grew on the southern slope were guarded from the watchtower near the top of the hill and had installations for storing agricultural produce, such as olives. The built installations can thus be dated, like the watchtower, to the twentieth century CE. Thirteen flint items were collected: one small, slightly damaged hammerstone (L131; diam. c. 6 cm; Fig. 23:1); eleven knapped artifacts, including one core, seven flakes and three ad-hoc tools; and one medium-sized lump of raw flint. In terms of raw material, this small collection is homogeneous: all represent the Meshash formation and are either beige or beige-gray in color with bright spots and some impurities. The items are fresh; the size of the artifacts and the characteristics of the cortex retained on the lump and on the primary elements indicate that the raw material comprised medium–small quarried flint nodules. Two loci in the eastern part of Area A yielded flint finds. In L124 were one amorphous flake core (length c. 5 cm), two flakes and one retouched flake; and in L128 (B1067) were one medium-sized flake with remains of cortex (Fig. 23:2) and a small primary flake with partial retouch. Locus 112, near the standing stone in the northwestern part of Area A, yielded five knapped artifacts—three flakes, one burnt primary element and one short, naturally backed knife with gentle retouch (Fig. 23:3)—and the abovementioned lump of raw material. These items were found along with a score of animal bones and donkey teeth (N. Agha, pers. comm.). The small amount of artifacts, their fresh appearance and the two colors of raw material are suggestive of just a limited number of episodes of on-site flint knapping, in which a few expedient tools were prepared for immediate use. 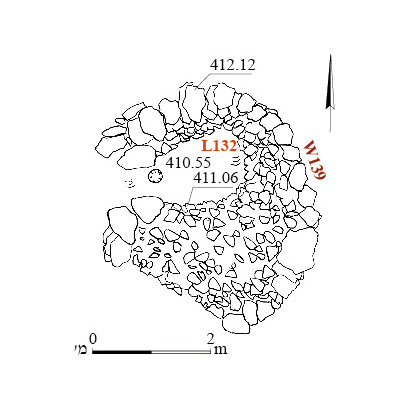 Although the site is poorly preserved and remains are fragmentary, the two excavations at the site of Khallat el-Himara, in 1996 and in 2012, point to agricultural activity possibly during the Roman period, and more intensively in the late Ottoman period, as well as a short-lived, small Late Bronze Age settlement on the summit of one of the highest hills in the Judean Shepelah. Most of the building remains belonging to the LBA settlement were unearthed in Eisenberg and Sklar’s excavation in 1996; the building remains unearthed in 2012 were badly damaged and rather scant. The remains unearthed in both excavations form a settlement that comprised at least three architectural units. Although the modern agricultural and terracing activity at the site damaged these remains, it is highly possible that most of the architecture of the LBA settlement was already razed and eroded in antiquity. The dwellers of this settlement probably cultivated vine and olive orchards on the slopes of the hill, using water from the tributaries of Nahal Yarmut. The complete lack of imported vessels and prestige items on the one hand and the dominance of cooking and storage vessels on the other hand testify to the agricultural-domestic nature of the settlement. However, the large standing stone (S1) located on the very crest of the hill, and possibly the nearby structure (L126), may reflect another facet of this settlement: a symbolic nature that benefited from the elevated topography of the site. 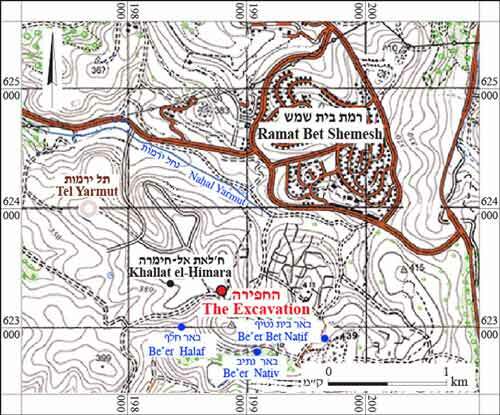 The small LBA settlement that existed on the crest of Tel Yarmut (Strata VI–V; Jasmin 2006: Fig. 1) is of importance for understanding our site, even though it too was poorly preserved, since it existed continuously during the thirteenth and twelfth centuries BC. Stratum VI, from which no architecture has survived, was dated to the thirteenth century BCE based on Cypriote and Mycenaean imported pottery. Stratum V, which has architectural remains but no imported pottery, was dated to the twelfth century BC and assigned to the LBA III or Iron Age IA (M. Jasmin, pers. Comm.). Since Khallat el-Himara has no imported pottery, it seems to be contemporaneous with Stratum V at Tel Yarmut, although the relation between the two neighboring settlements remains unclear. 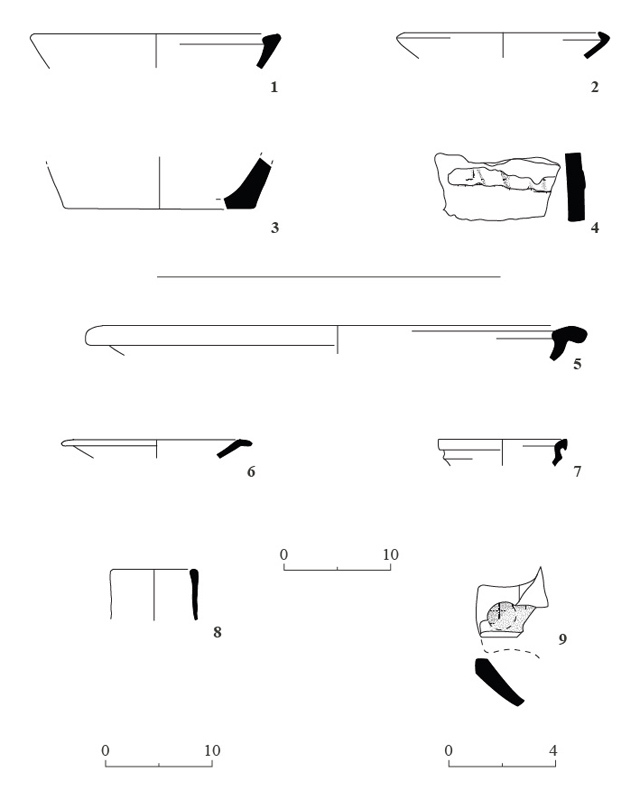 A twelfth century BC date is also suggested by parallels to the pottery assemblage, mainly carinated bowls, found at Tel ‘Azeqa (S. Metzer, pers. comm.). The recent excavations there revealed a flourishing twelfth century BCE urban entity that was destroyed in a violent conflagration (Y. Gadot, pers. comm.). This date is further corroborated when comparing the pottery assemblage to that of Lachish Stratum VI (Ussishkin 2004). Khallat el-Himara was probably one of four villages (4–10 dunam) of this period within the boundaries of today’s Ramat Bet Shemesh. The other three—Tel Yarmut, Tel Zanoah and Kh. el-‘Aliya—are mentioned in Jasmin (2006:164, Fig. 1, Sites 81, 83, 85), who discusses the political organization of city-states in southern Israel in the thirteenth century BCE. Since the four villages are too distant from the larger political centers of this period, such as Tel Lakhish, it seems that they had ties with the two urban centers in the area—Tel Bet Shemesh and Tel ‘Azeqa—which probably served as ‘sub-regional centers’. It seems that these villages and the small settlements identified in Dagan’s (2010) can be divided into two clusters: those north of Nahal Yarmut, which were dominated by Tel Bet Shemesh; and those south of Nahal Yarmut, including Khallat el-Himara and Tel Yarmut, which were dominated by Tel ‘Azeqa (Jasmin 2006: Figs. 1–4). This suggestion is based, among other things, on GIS Viewshed Analysis that clearly differentiated these two clusters (Paz and Birkenfeld, forthcoming). Eisenberg E. and Sklar D. 2000. Nahal Yarmut. HA-ESI 111:76*–77*. Gadot Y. 2009. The Late Bronze Age Pottery. In Y. Gadot and E. Yadin eds. Aphek-Antipatris II: The Remains on the Acropolis; The Moshe Kochavi and Pirhiya Beck Excavations (Tel Aviv University Institute of Archaeology Monograph Series 27). Tel Aviv. Pp. 182–341. Jasmin M. 2006. The Political Organization of the City-States in Southwestern Palestine in the Late Bronze Age IIB (13th Century BC). In A.M. Maeir and P. de Miroschedji eds. “I Will Spaek the Riddles of Ancient Times”: Archaeological and Historical Studies in Honor of Amihai Mazar on the Occasion of his Sixtieth Birthday I. Winona Lake. Pp. 161–190. Paz Y. and Birkenfeld M. 2017. Reconstructing Socio-Political Urban-Rural Interactions Using Viewshed Analysis: The Late Bronze Age at Ramat Bet Shemesh, Israel. Journal of Landscape Ecology 10 (3): 230–244. Ussishkin D. 2004. The Level VI Pottery from Areas D and GE. In D. Ussishkin. The Renewed Archaeological Excavations at Lachish (1973–1994) V (Tel Aviv University Institute of Archaeology Monograph Series 22). Tel Aviv. Pp. 1235–1242. 2. Eastern part of Area A, plan. 3. Northwestern part of Area A, plan. 4. Squares G/2–3, looking south. 5. Northwestern part of Area A, looking southwest. 6. Squares A–B/9 and B–C/10, looking northeast. 7. Standing stone (S1), looking east. 8. Wall 130, looking south. 9. Unit 126, looking northwest. 10. Late Bronze Age pottery from Area A: bowls and kraters. 11. Late Bronze Age pottery from Area A: cooking pots. 12. Late Bronze Age pottery from Area A: storage jars. 13. Late Bronze Age pottery from Area A: jugs, juglets and varia. 14. Early Bronze Age (1–4) and Roman period (5–9) pottery from Area A. 16. Watchtower 132, looking east. 18. Installation 136, looking north. 19. Installation 140, looking north. 21. Installation 154, looking north. 22. Stone Clearance Heap 164, plan.